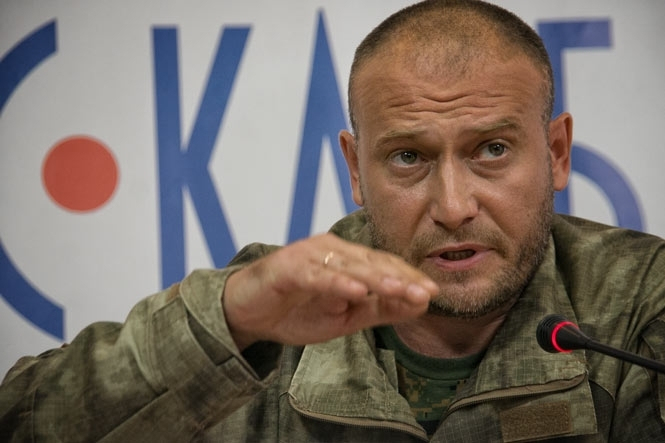 Dmytro Yarosh, leader of Pravy Sector arrived in Lviv in a huge jeep with ‘PTN-PNKh’ plates and, as he admitted, with a grenade in his pocket. He said that he was starting his political campaign journey across Ukraine. However, if the situation on the eastern front changes, he will have to go back to his deployment position. 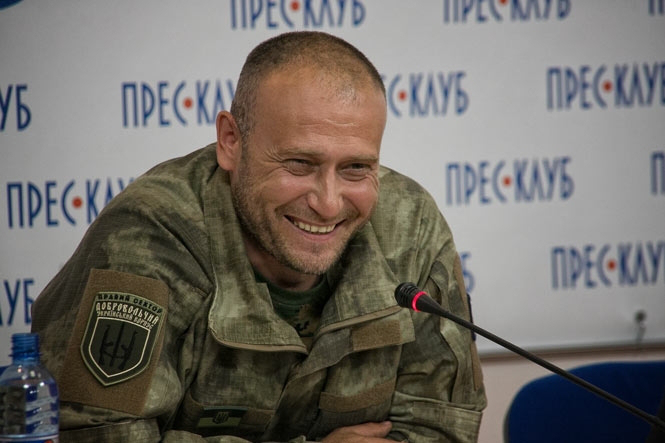 In an exclusive brief interview with iPress.ua, Dmytro Yarosh told us what he would do in the Verkhovna Rada if Pravy Sector got the required percentage, about his relations with the current government and about the legalization of the Voluntary Ukrainian Corps. You said that Right Sector is on the verge of getting into the Verkhovna Rada. Do you have any idea of what you’ll be doing in Parliament? We see our mission in Parliament this way – we’ll be the pike that won’t allow the carp to fall asleep, we’ll stir up all that parliamentarian mud bog – 70% of which will probably be shuffled around anyway, we’ll do everything to ensure that those people are working for Ukraine, and not for their own pockets. Of course, we’ll propose conceptual ideas to reform the power block of the government. We’ll rely on community support because a small group of people can’t do anything without the people. If it’s a question of bringing several thousand people to the Verkhovna Rada and blocking its activity in case an important strategic bill is rejected, this will be perfectly realistic. Moreover, Right Sector has extensive experience in organizing such events. You saw our rally and march on the Feast of Pokrova. Kyiv has never seen anything like it. We have a lot of human resources that we can count on and thus push through needed bills. Right Sector today – these are people with weapons and military experience who now have political objectives? Do you really understand how to make use of such influence on the government? We were able to achieve certain goals. They were more tactical. There’s the lustration bill, which we’ve supported since the Maidan. We managed to talk to certain people in the government and make sure that this law was passed. That is also our contribution. At present, we’re doing all we can to have the law on weapons approved; it would allow law-abiding citizens to possess and use firearms. We’ll push it through, I’m sure. We have some leverage here. We have a common language with police and security forces and in the MIA and SBU. The Volunteer Ukrainian Corps (DUC) has not been legalized like other battalions – do you want this to happen or are you just a thorn in the government’s side? Perhaps the government doesn’t want us around. DUC is a unique military-political movement. The government is well aware that such a movement may be the beginning of a kind of modern Kozak group, not the ‘sharavary’ kind (wide loose pants worn by Kozaks-Ed. ), but more active and effective. We held talks with Turchynov and his administration in March and asked them to give us this status. They keep blocking it, delaying it, presenting different options that don’t suit us. What about the Ministry of Defense? We talked to the General Staff. We came to an agreement that we would work under the Central Intelligence Administration. But, the next day they completely changed the schedules and gave us the option to defend a territory that didn’t suit our purposes. How many soldiers in DUC? You constantly remind everyone that Right Sector will take appropriate action if the government fails to fulfill certain requirements. What actions do you mean and what is stopping you from organizing such actions? I really don’t want to destabilize the situation in the country when there’s fighting on the front lines. We’re all well aware that I can send several battalions to Kyiv and resolve the government issue. That’s real. Our citizens dislike the government so much that it would be easy for us to do. But, I also understand that it will pave the way to Kyiv for Putin and his troops. This cannot be allowed. That’s why we strongly opposed the soldiers’ rebellion, and I even sent several of our front-line soldiers to talk to them, to tell them we shouldn’t organize such actions. What do you think of the events in Donbas – is it peace, a truce, calm before the storm? There have been no active offensive operations in the Donbas this month. And there was no ceasefire either. I repeat… there was not one day or night that we did not have to fight. When they say that it was quiet, that it was silent, that there was no artillery fire, that’s all a lie. The truce was not respected by the other side, so naturally we shot back. But, this ‘truce’ has several positive aspects. The first – the exchange of prisoners. This should be done; we can’t just abandon our guys; there are still 500 of them in enemy hands. Second – it enabled us to stabilize the front lines, re-equip the brigades that were surrounded, reformat our forces and bring in more hardware. But, let’s wait and see what happens now because intelligence has sent out information that they are preparing a large-scale offensive on our positions on all fronts. Our troops are ready; they’re undergoing heavy defense training. Do you expect that there will be a time when the DUC and Right Sector may be the only forces fighting against the enemy under the provisions of President’s peace plan? I’m very well aware of the mood prevailing in army divisions that we fought with and are still fighting with. I know that many brigades of the Ukrainian Armed Forces don’t want to listen to ridiculous orders about a truce and so on. In any case, we won’t be alone. There are even some jokes going round about some brigades… that such and such a brigade of the Armed Forces is really Right Sector. We have some authority in the army. Is it really necessary for Right Sector to be so radical? Like on October 8 in Troieschina when your guys destroyed illegal slot machines and then got into a fight on the streets? If we wanted everybody to like us, we’d be like walking dollar signs. Everyone likes dollars. We do what the government doesn’t do. If the state does not respond in a civilized way, the citizens will do so. I don’t see anything positive about throwing corrupt officials into garbage bins. It’s best to send them to prison. So, if the government doesn’t do that, ordinary people will throw these thieves who are still in power into garbage containers. Why should the Donetsk Airport be defended? The airport has become a symbol of resistance of the Ukrainian Armed Forces. We were able to build an effective defense at airports. We’re taking more specific measures, but I can’t talk about that now. The General Staff has deployed reinforcements. The 93th Brigade, the 17th Tank Brigade and Right Sector were stationed there previously. Now, there are troops from the 79th and 95th Brigades. The 17th Tank Brigade… these are amazing guys. Their combat operations are heroic. Our defense is relatively effective. There was a very important assault one and a half weeks ago. We managed to make mincemeat of their group. 450 terrorists took part in this battle, but only 18 got out. We also lost two guys from Right Sector, and about ten were wounded. You can see for yourself the difference in losses. I mean, the enemy can be beaten if plans and objectives are clearly and correctly defined. I wouldn’t advise the generals to give up the airport because it’s a symbol of our war. We’ve taken revenge for Ilovaisk by inflicting incredibly heavy losses on the terrorists at the airport. What do you think of the presidential decree on pardoning the terrorists? Negative. When we liberated territories during the summer offensive campaign and were squeezing the separatists into a corner, we entered towns and villages and saw what those monsters had done to peaceful ordinary people. Avdiyivka is located just north of Donetsk. We enter the town… it’s a torture chamber – people handcuffed to posts, dead bodies, spilled intestines, blood everywhere… Forgive those who did this? That’s utterly unacceptable and wrong. I hope that all these laws and the so-called truce are just a game that our President is playing. If not, we’ll see it as a betrayal of national interests and our response will be adequate. Is Ihor Kolomoisky financing the Right Sector? I saw him early June. The Right Sector political party doesn’t take a nickel from the oligarchs. I think that Kolomoisky will confirm that. Oligarchs can’t talk to me about money. But, we’re actively collaborating with the Dnipropetrovsk Regional State Administration, in two ways. 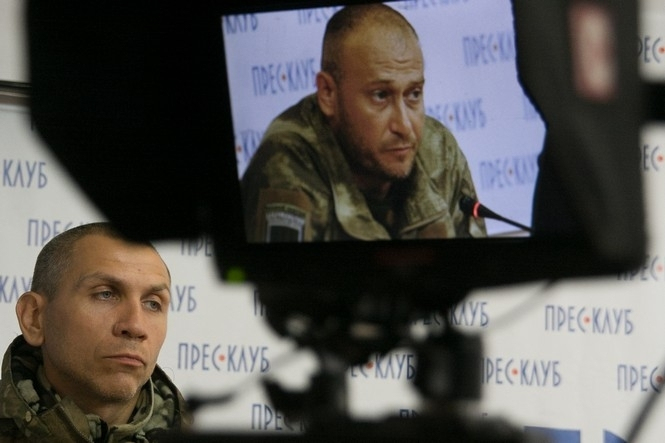 In May, Right Sector subdivisions entered several districts of Donetsk oblast at the request of the administration – Krasnoarmiysky, Dobropilsky, Velykonovoselkivsky – drove out the terrorists and created a buffer zone. Since the beginning of the war, the administration has given us about 200,000 hryvnias to equip our rear base. This is all the money that we got from Kolomoyskyiy, so to speak. These are not such great amounts that we can talk about. Today, the Regional State Administration has a patriotic position. We also have quite a few wounded, more than a hundred since the war started. We get full support and assistance at Dnipropetrovsk hospitals. They get everything they need from the Regional Administration and Kolomoisky.